Where Did Those Pink and Blue Striped Baby Blankets Come From? Where Did Those Pink and Blue Striped Baby Blankets Come From? Where Did Those Pink and Blue Striped Hospital Baby Blankets Come From? You may not notice at first glance the common newborn baby picture that parents take, but when you put two social media pictures of newborn babies side to side, you’ll likely notice one blatant similarity – the receiving blanket the baby is wrapped up in. Chances are, both baby blankets will be white, with those familiar blue and pink stripes. This isn’t just something that is common in photos from this new age of technology though – you’ll find the same thing on newborn babies from 50 years ago! Is this some grand conspiracy? The combination of the pink and blue stripes make this linen gender-neutral so they don’t need to be swapped based on baby’s gender. These blankets are oftentimes cheaper than their patterned counterparts. Because of their popularity, they are easier for nurses and doctors to identify amongst their linens. The origin of this receiving blanket is actually fairly simple. It was all started by a healthcare linen supply company named Medline, located in Mundelein, Illinois, and by A.L. Mills, to be exact. His original job was to make butcher aprons, and eventually that led him to creating surgical attire. As it became more common for women to give birth in the hospital setting as opposed to at home, the drab cloth that hospitals were using as a baby blanket was in need of an appealing upgrade. That’s where Mills came in. He settled on the white, pink and blue combination because it was simple, so it wouldn’t detract from the real focus of the event (the baby), and it also kept the receiving blanket gender-neutral so the blanket could remain versatile. And his intentions behind the design were picked up…a lot. Every year, Medline sells approximately 1.5 million of this design, which has been called the Kuddle-Up blanket. Need Baby Blankets for Your Medical Facility? The best way to acquire these blankets for your hospital isn’t to simply purchase. 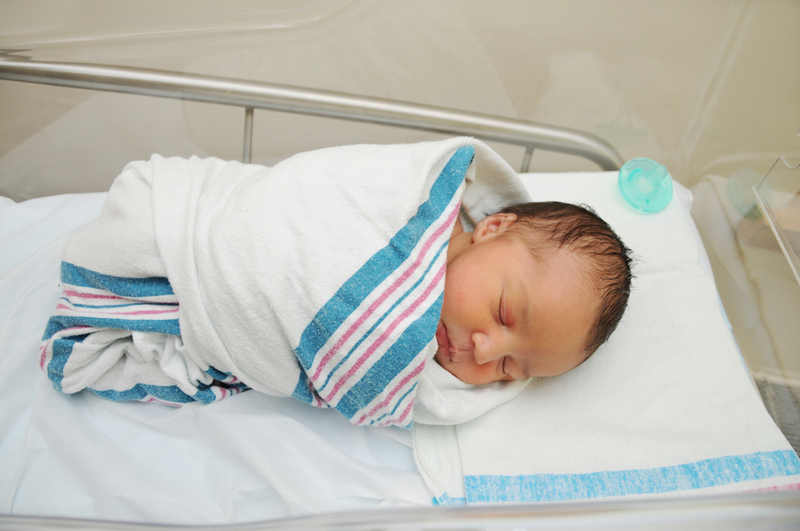 You may instead want to consider getting your baby blankets through a medical linen rental company. This is because of the potentially steep costs that linen loss from baby blankets poses to your hospital. Linen loss is the result of parents stealing these receiving blankets, as well as employees incorrectly laundering the baby blankets. When your business experiences linen loss, you have to pay the price of replacing each and every receiving blanket. When you work with a medical linen rental program like MEDtegrity, your linens are better accounted for and laundered with the quality your medical facility needs. At MEDtegrity, our partners carry an assortment of patterns for our baby blankets, but also include that classic white cotton, flannelized blanket with the blue and pink stripes that your hospital might be looking for. All of the receiving blankets in our line are soft, warm and comforting. To learn more about how our service works, contact us today at 888-893-3334.